Based on reviews from 218,771 users. 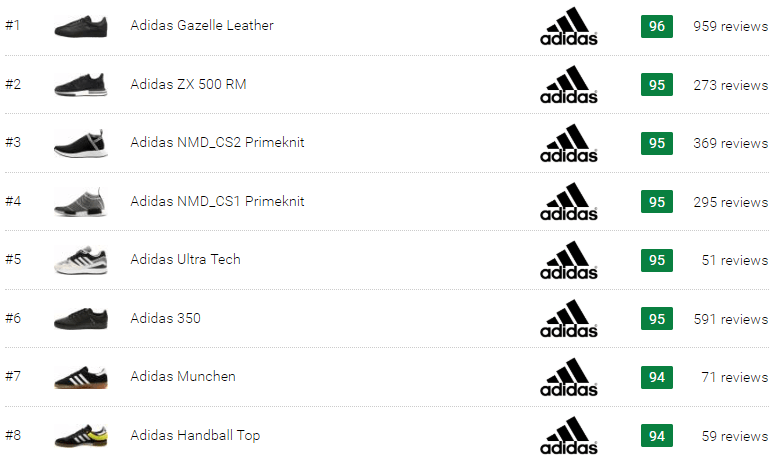 Learn how our rankings work or see our guide to black Adidas sneakers. Updated Apr 2019. Unlike white sneakers, black Adidas shoes are simple, and you don’t need to worry about keeping them clean. It is also an awesome addition to a classic look. However, unlike men, women may sometimes find it challenging to finding a perfect pair of black Adidas sneakers because most of the time black shoes are offered in men’s sizing while women’s sizing is available, most often than not, in bright or pink colors. As a solution, women can just pick their size but 1.5 sizes down from the men’s sizing to get their exact fit. Whether you are checking for a pair of Adidas all-black sneakers or black and white Adidas shoes, you may check some of the iterations below that are available in a low-top silhouette. Low-top silhouette offers foot better ankle mobility. Adidas Matchcourt ADV – Available in a pair of black Adidas sneakers, this iteration utilizes a silhouette that caught the attention of skates in the ‘70s and ‘80s. Comes with an extra-cushiony PU sockliner for impact protection and comfort. It has a heavy-duty suede upper with a reinforced toe cap that stands up to abuse. Durable vulcanized outsole for excellent board feels and excellent traction. It has a textile lining for added comfort. 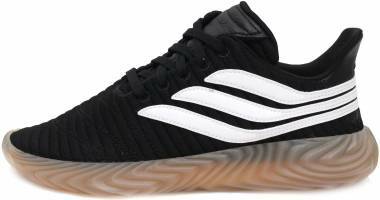 Adidas Samba ADV - For people who are looking for a nice pair of black and white Adidas shoes, check out this iteration. The Adidas Samba ADV is designed to meet the modern skateboarders’ needs of reliable grip, board control, and comfort. It has an upper with a combination of leather, suede and synthetic materials. The outsole has directional herringbone pattern for amazing board control and excellent grip. It has molded PU sockliner for comfort and impact cushioning as well as molded TPU heel clip for better and added support. 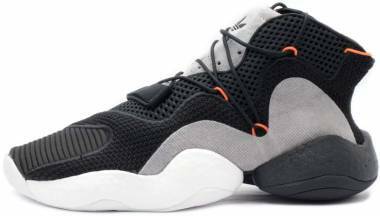 It has a knit upper with welded and nubuck overlays. It has the TPU lace ghillie as well as heel cage. The Ortholite sockliner provides performance and comfort. It is built with the EVA midsole wrapped with a PU cage. It is built with Cloudfoam Memory sockliner that molds to the foot, providing supreme step-in comfort. It has Cloudfoam midsole wedge for superior cushioning and undeniable comfort. This iteration has a rubber cupsole. It has a synthetic leather upper with perforated 3-Stripes and embossed heel logo. It has a breathable mesh upper. Another version of it is built with a Primeknit upper for a more adaptive fit. It bears the reflective 3-Stripes. It utilizes the Bounce technology, providing an all-day energized comfort. It has a vulcanized outsole with the Vector Traction tread that provides outstanding grip and precise board control. It is built with Adiprene that provides superior cushioning and impact protection. It has leather and suede uppers. It has a premium leather upper that gives foot breathability. It utilizes the Ortholite sockliner for performance and comfort. It has a canvas lining for added breathability and comfort. It has a leather upper. It has the perforation in between the leather 3-Stripes. The Adidas branding in gold is accented on the sides, and the Trefoil is patched on the heel. The upper is made of leather and suede materials. With a sleek design, it is built with a Lace-up closure for an adjustable fit. It has a rubber heel counter that is collapsible, allowing the users to put on the shoe without lacing it. Adidas Los Angeles – In the summer of 1984, this iteration became famous when runners from different parts of the world competed in Los Angeles. Check out its key features below if you are searching for a pair of black and grey or all-black Adidas sneakers. A lightweight shoe, it a mesh upper that provides comfort and breathability. It has leather heel lining and collar. Adidas Sobakov – It is among the streetwear sneakers that catch the fervor of soccer fans. It is available in different colorways including all-white and white and black Adidas shoes. The stud-inspired rubber outsole features a wavy herringbone pattern. It has an asymmetric upper with reflective and swerving 3-Stripes. Adidas Samoa - First dropped in 1982, the easy-going Samoa that is a fan-favorite. It has a classic look fused with the modern design. 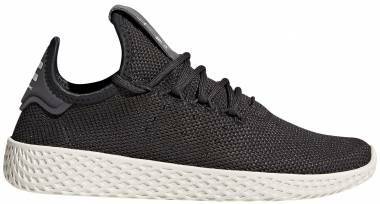 Check out this shoe if you are looking for a pair of all-black or white and black Adidas sneakers. It has a rubber toe guard. It has gum outsole with the Trefoil pattern. It has a breathable textile lining. The upper is made of synthetic leather. 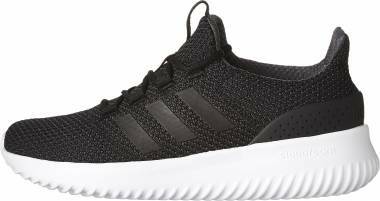 Black Adidas sneakers with a mid-top silhouette provide ankle protection and support compared with those shoes with a low-top profile. Below are some examples based on their heritage. Adidas Splendid - This shoe is designed as a classic mixed with a futuristic silhouette. It has a stylish aesthetic without compromising comfort. It is available in different monochromatic colorways. It is among the black Adidas sneakers you can check out. It has mixed-suede heel panel on its 3D diamond textured textile upper. It has Ortholite sockliner for comfort and performance. It is built with a vulcanized cupsole. 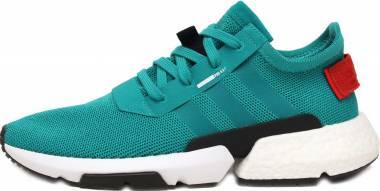 Adidas Cloudfoam Lite Racer Mid – With a flashy racer style, it is known not only for its on-point design but also for comfort which are perfect for everyday use. It utilizes the Cloudfoam technology that delivers excellent in-step comfort and cushioning. It has a mesh upper with a TPU help clip. It has dual layer sockliner combines Cloudfoam and Memory foam footbed for long-term comfort. Adidas Crazy 1 ADV – A streetwear reinvention, this shoe reached its champion status in 2000. 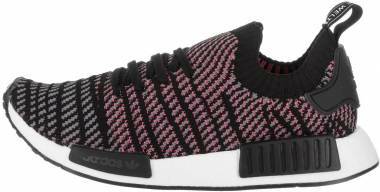 It has different colorways available, and you can check it out if you are trying to find a good pair of all-black or black and white Adidas shoes. It has a knit and suede upper with a sock-like construction that hugs the foot. It has dual-density polyurethane outsole. The tongue has the Adidas Trefoil logo. Adidas Matchcourt Mid – Inspired by the authentic Adidas heritage, this shoe specializes in durability. Available in different colorways, this release brings the ‘70s-inspired Matchcourt Mid to sneaker fans of all ages. It has a durable suede upper with synthetic 3-Stripes. It has molded PU sockliner. Compared with mid-top and low-top silhouette, the high-top silhouette provides ankle protection and support that a user needs. This footwear significantly extends over the ankle of the wearer. Although high-cut profile is commonly used for basketball, it also is seen on skate and running shoe. 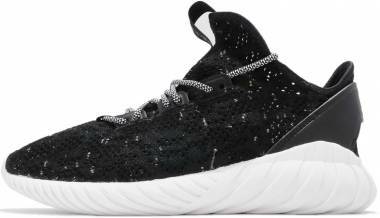 Adidas Tubular Doom Primeknit – A fashion-forward street sneaker, the Tubular Doom Primeknit provides an adaptive fit. It has a design that is inspired originally by inner tire tubes. Available in different colorways, it can be considered by people who like a pair of comfortable black Adidas sneakers. The Adidas Primeknit upper provides a flexible, breathable and enhanced fit. It has a wide elastic strap over instep and forefoot. Built with one-piece EVA midsole, it also has an outsole with tire inner tube-inspired construction. With a full grain leather upper, it has a perforated toe area. It has a well-cushioned collar and padded tongue. Adidas Matchcourt High RX – With a high-top silhouette, this iteration is inspired by Adidas heritage. It has a lightweight EVA sockliner. It has a canvas and suede uppers. With a durable-wrapped foxing tape, it has a vulcanized outsole that provides reliable traction. With a lace-up closure, the Adidas Suciu ADV features a Gothic architectural design. It is designed to withstand frequent abrasion. It also utilizes the Adidas Adiprene insole. You can check out its black colorway if you are looking for a pair of black and white Adidas shoes. The leather 3-Stripes in white is adorning the black mesh upper, providing the right contrast together with its gum outsole. Initially launched in 1984, the Adidas Boston Super is among the black Adidas sneakers that pay tribute to the successful annual event. Released in 2017, this iteration is a collaborative work of Adidas and the Japanese Brand White Mountaineering which is a modernized version of the classic silhouette. The Adidas Boston Super Primeknit features a premium and breathable knit upper that provides comfort as well as a premium pigskin overlay for support. 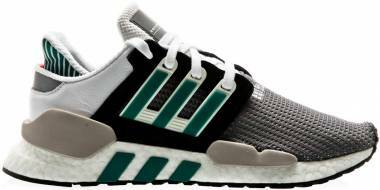 It also has the White Mountaineering-branded sockliner and textile lining for added comfort and EVA midsole for lightweight cushioning. For reliable traction, a rubber outsole is utilized. In partnership with Dennis Busenitz, Adidas released another iteration that is packed with technologies to help skateboarders. One of the black Adidas sneakers with a vulcanized gum outsole, the Busenitz Vulc provides precise board feel and responsive grip. The black colorway has a suede upper that offers adequate foot air ventilation. It utilizes the Geofit technology on the ankle collar for increased comfort and anatomical fit. Another technology this iteration features is the Adituff for increased shoe’s longevity. It also has the nano heel cushioning that offers excellent shock absorption. 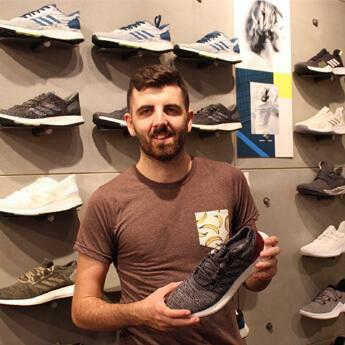 A French skater Lucas Puig collaborated with Adidas to provide a pair of kicks that offer excellent board feel and effective cushioning to match Puig’s style. Released in 2010, the Adidas Lucas Premiere Primeknit utilizes durable and lightweight material that offers flexibility and breathability. Inspired by archive volleyball footwear, this pair of black Adidas sneakers delivers a unique blend of comfort, style, and performance. It has Primeknit textile upper that ensures foot breathability. The toe area utilizes the Adituff technology for enhanced durability. It has a grippy rubber cupsole that provides excellent traction. If you are wanting a pair of Adidas black and grey shoes or all-black Adidas sneakers, check out the Adidas Silas Vulc ADV. This collaborative work of Adidas and Silas Baxter-Near, was released in 2017. It is durable and improved footwear that is perfect for any skateboarding style. This iteration focuses on delivering excellent board feel. It has a suede upper and with a gusseted tongue that provides foot breathability and great fit. With a vector traction outsole and grippy tread design, the Adidas Silas Vulc ADV offers a sure-footed grip as skaters perform their flips and tricks. It has the Silas Baxter-Neal graphic with molded foxing. Launched in July 2013, the Adidas Y-3 Qasa High is available in different colorways. One of the crowd’s favorite is a pair of black Adidas sneakers. The “Y” stands for Yohji Yamamoto while the “3” stands for its popular insignia which is the 3-stripes. The dash sign signifies the connection between the two iconic figures. It has a flexible upper with an elastic vamp and heel strap, providing an adaptive fit and undeniable comfort. Modeled after the car tire treads and tubings, the EVA Tubular sole unit is installed. It also features a Poron performance cushioning for added comfort. Released in 2013, the Adidas Yeezy 750 Boost is the first collaborative work between Kanye West and Adidas for the Three Stripes. It has an upper with a futuristic design that provides durability and foot air ventilation. Seen on the midfoot, the Velcro strap features the Adidas brandings. For those who desire to have a unique and stylish pair of all-black Adidas shoes, this iteration is an excellent addition to their arsenal. 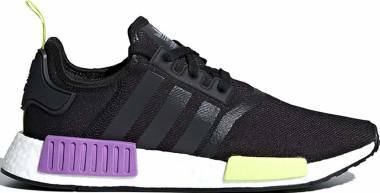 Where to buy black Adidas sneakers? Aside from the brand’s main website www.adidas.com, Adidas sneakers can also be purchased from major retailers as well as online resellers like Lyst, Zappos, farfetch, 6pm, DSW, Nordstrom, PacSun, and shoe carnival. 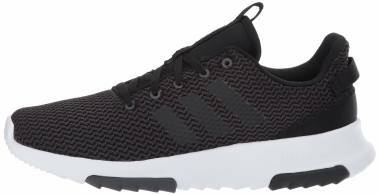 What are some of the technologies in black Adidas shoes? Torsion System – A lightweight arch support which helps the rearfoot and forefoot to move independently. Adiprene – Found at the heel of the shoe, it helps to provide impact reduction, protecting the heel and sparing the joints from stress. Geofit – Small cushions which anatomically fit inside midsole on the ankle area, providing increased comfort. Adiftuff – It’s an abrasion-resistant material that improves outsole’s durability at high sideways acting forces. Climacool – The best ventilating shoes which midsole has small holes and its vamp is made out of pearl canvas textile. BOOST – This cushioning is softer and provides undeniable comfort. The Energy Boost offers not only comfort but also more energy returns which provide an excellent running experience. Bounce – Designed with the outsole’s anti-collision protectors, it provides stable comfort and doesn’t affect performance whether on a warm or cold environment. Adiwear - Found on the outsole, it is a wear-resistant material that allows the shoe to withstand abrasion even at high strain. Supercloud – A sole-sponge material that does not absorb water. It takes the foot’s shape of the wearer, providing more comfort. Ortholite – A shoe insert that provides an antimicrobial benefit which leads away humidity, keeping the foot fresh and healthy. What to wear with black Adidas sneakers? For a chic street style, ladies can wear their mini black dress together with a black bomber jacket and match it with their pair of black Adidas sneakers. A pair of black and white Adidas shoes looks well with white top and crispy white coat along with black leather pants. For a minimalist look without sacrificing comfort, men can wear a pair of all-black Adidas shoes and match it with white chinos and a black leather bomber with a white shirt under. Men can also wear their black Adidas sneakers with a dark print shirt and distressed denim shorts for a comfortable look and feel from head to toe. How do Adidas black casual sneakers fit? Generally, Adidas sneakers are available in men’s sizing ranges from 4 to 14.5 while women’s sizing ranges from 5 to 15.5 US. What are some of the iterations of Adidas black and rose gold sneakers? What are some of the iterations of black and white Adidas shoes? What the black Adidas sneakers excellent for skateboarding activities? What are Adidas iterations available in an all-black colorway? How can you tell if a pair of black Adidas Superstar shoes is fake? On the tongue label, check the numbers if they match those found on the label of the box. The right should also be different on from the left shoe's serial number. The outsole should have a distinct pattern. The shape of the lines and groove should be consistent. How much does a pair of Adidas black shoes cost?